_MAL3110, originally uploaded by Michael A. Lowry. "What do Americans think about Germany?" "Did you vote for President Bush?" "What do Americans think of the war in Iraq?" It was interesting to chat with the students. I tried to impress upon them that not all Americans are ignorant of the rest of the world. I also encouraged them to study abroad if the opportunity presents itself. Nothing helps one better to understand oneself and one's home country than a fresh, outside perspective. School ends around lunchtime in Germany. So after her classes were done, Andrea took me to one of her favorite lunch restaurants in town. We had aufläuf, a sort of noddle casserole. It was tasty and filling. 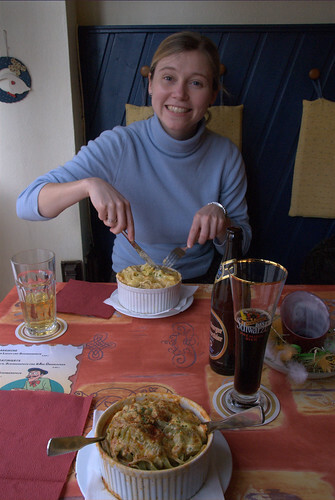 It reminded me a bit of Belgian or Slovakian food: hearty, and with lots of noodles and cheese. Later in the afternoon we went to a wholesaler similar to Costco, where I bought a bunch of liquor at about 1/3 the price one would have to pay in Systembolaget in Sweden. Then I picked up about a dozen bottles of assorted beers at a local supermarket. Yes, I know it's not possible to take large quantities of liquid in one's carry-on baggage. What was I thinking? More on this later. Does Al Gore have it wrong about global warming? Why do people believe in god? Picking up the cats from Sarah's place.